This tutorial shows how sound files can be loaded and played. 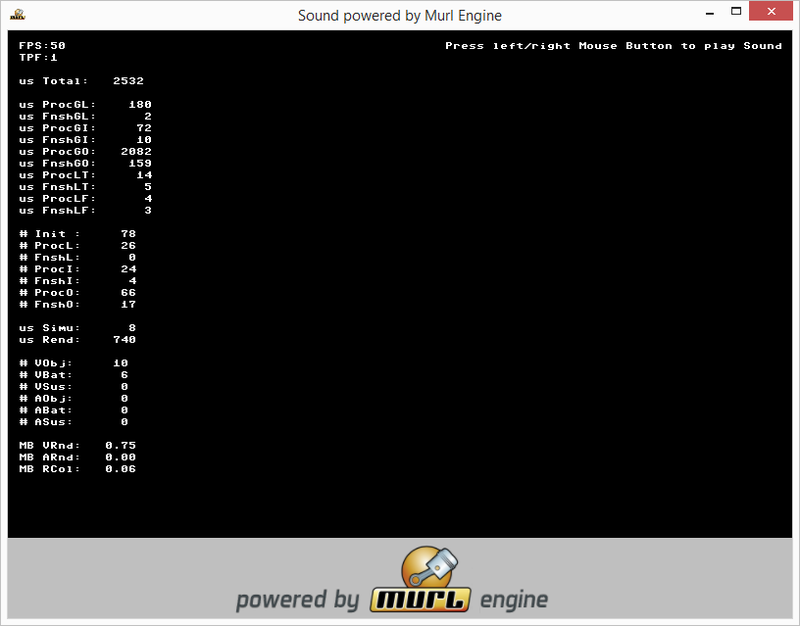 Beside audio sources the Murl engine also places audio sinks (listener) as graphic nodes in its virtual world. By doing so, it is possible to also consider positions while playing audio files. Depending on its position a sound is louder either on the left or on the right speaker and becomes quieter with increasing distance. Only mono sounds are dependent on their position. Stereo sounds, however, are always played with the same volume and according to the left-right-setting defined in the sound file. Make the audio resource available in the graph (Graph::AudioSource node). Position the audio source in the virtual world (Graph::AudioSequence node). Create a timeline in order to control the audio source (Graph::Timeline node). Position an audio sink (listener) in the virtual world (Graph::Listener node). The AudioSequence graph node represents an audio source within the virtual world. The attribute audioSourceIds specifies, which sound resource should be used by this audio source. These string values directly map to one of the enumeration values from IEnums::SampleFormat. If two or more audio files are played in an AudioSequence, any differences in the sample resolution (e.g. 16 bit/8 bit) and mode (mono/stereo) are automatically adjusted. However, the sampling rate responsible for the playback pitch remains unaffected, so it is recommended to use the same sampling rate for all of these sounds. The volume attribute allows adjusting the sound intensity, with useful values ranging from 0.0 to 1.0. The value of the attribute rolloffFactor affects the calculation of the volume. The exact method of calculation is explained in the documentation of the Graph::IListener interface. The Timeline graph node creates the time section which we want to play our sound in. The attributes startTime and endTime define the part of the sound file we want to play with the value being specified in seconds. By specifying a negative startTime it is possible to delay the starting time of the sound. The graph node Listener creates a listener for a certain view. We only define the attribute viewId and use the standard distance model INVERSE_CLAMPED. With the ListenerTransform node we position the listener within the virtual world and with the ListenerState node we activate the listener for all subsequent audio sources. Similar to the sample formats explained above, these string values also directly map to one of the enumeration values from IEnums::DistanceModel. Again, the exact method of volume calculation is explained in the documentation of the Graph::IListener interface. The Logic::TimelineNode objects are used in the OnProcessTick() method to control the playback. By pressing either the right or the left mouse button the timeline is set to start and the sound is played once again. If the total duration of the sound files is unknown, it can easily be queried from the AudioSequence node by using the method GetTotalDuration(). The new start and end values can be passed to the Start() method of the Timeline node. If this method is now called with its new start and end values, a Rewind() is called as well. Vary the parameters for position, volume and rolloff factor. Modify the OnProcessTick() method so that the end times of the Timeline nodes are retrieved from their corresponding AudioSequence nodes.